Andre M Poineau Woodworker has developed a legal way for lakefront residents to have floating Boathouses in front of their homes. 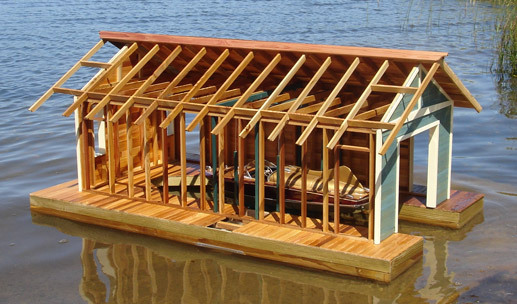 These patent pending boathouses are assembled and floated to your property, ready for use. At the end of the season, the boathouses are floated to a site with access to upland storage. Your boathouse also acts as a storage building for your boat for the winter. Lakefront owners with relatively flat lots can store their boathouses on their own property, this also could allow for a double wide Boathouse. This patent pending process has taken over a year to design and engineer and is only available to you through Poineau Woodworker Inc. Please see more renderings and information in our Portfolio page. If interested call today.